Platinum Pen company is a curiosity... one of the "big three" Japanese pen companies still around today. Pilot is clearly the leader, in terms of volume. I think Platinum comes second, with Sailor about third. 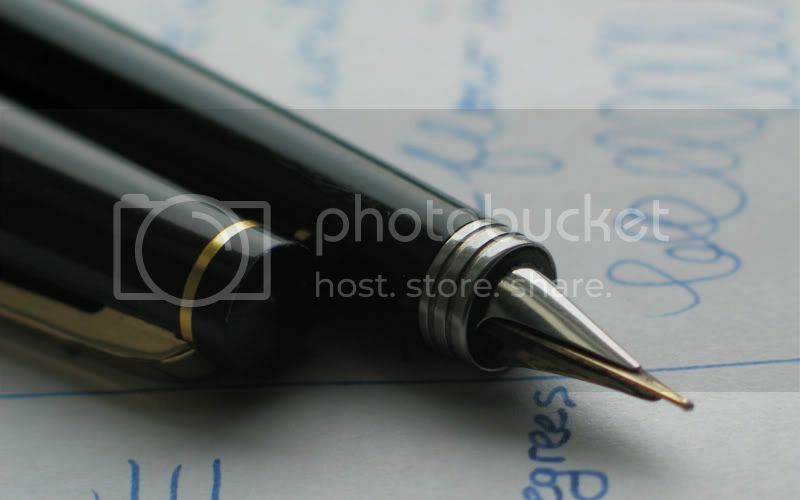 But in terms of fountain pens, I'd say Sailor is generally ahead of Platinum. These days, they do not have many interesting models to offer. The Presidential is a very nice pen and the 3776 has been well received, but beyond that... well, I just haven't warmed up to their latest scant offerings. So, I've rummaged around "that auction site" looking for vintage Platinum pens and came to discover a few interesting models that I've acquired, the most cherished being a vermeil silver pen with artful decoration (I'll review that sometime later). One of the more unusual was this double nibbed pen. Anyone who knows vintage Parker will remember the 180--a long slender pen with a curious triangular nib that sports a certain sized nib on one side, and rotating (rolling) the pen over 180 degrees would reveal another nib size. I think they are mostly XF and F sized. That is what Platinum tried to achieve with this pen. First Impressions (08/10) - A weird "pocket size" knock-off of the Parker 180. It looks sleek, almost space-age like the Pilot MYU/M90 integrated nib. 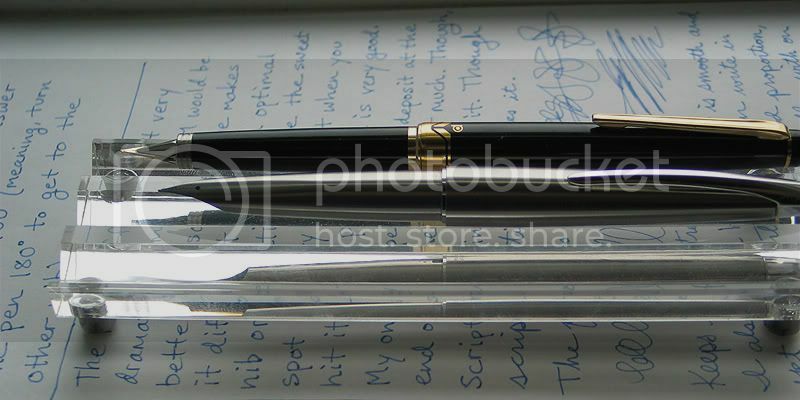 But aside from the nib, it looks like your rather commonly seen black plastic pocket pen with gold accents. The gold band is thicker than on its brother, the Pilot Elite, and I like the little design with the "P" logo on it. There is also a tasteful ultra thin gold ring on the barrel bottom. The cap is longer than what you usually see on a Pilot Elite, almost as long as the body (must be quite a bit of space buffer for the nib)! Nice looking pen, though. Appearance & Design (07/10) - Two for One! There is no model name imprinted, but I've learned it is called the "PKW-5000". The intention of this pen is to deliver two nib sizes in one pen. In this case, XF and F. And it is housed in a "pocket pen" sized body. 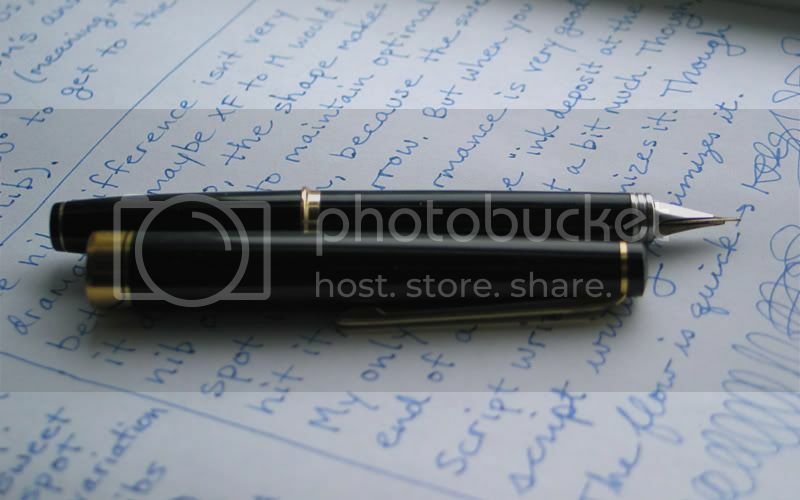 This is where the lower body of the pen is very short, while the section and cap is rather long. You take the cap off and post it--tada, you now have a standard sized pen. 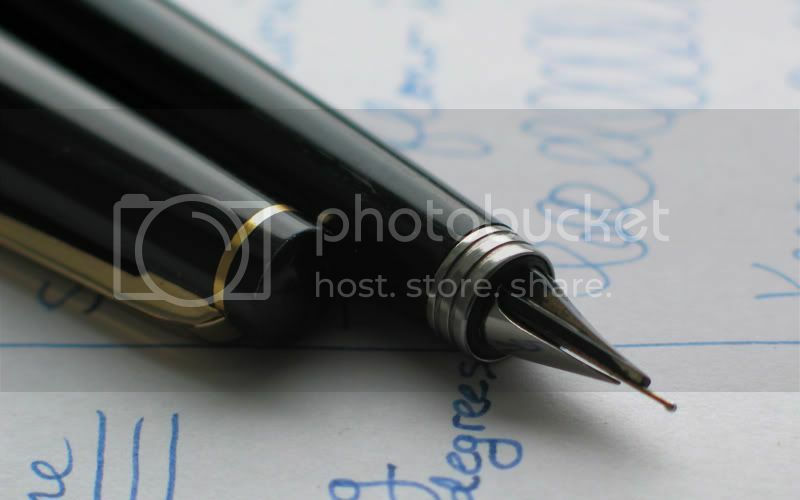 Cap it, and the pen is smaller than your average pen, fitting comfortably in a shirt pocket. Given the light weight of the pen, it serves this purpose well. The clip is spring loaded, a very welcome feature so that pocket material is not snagged. The only major turn-off is that the pen takes Platinum cartridges. The body is too short to take a converter. However, there are adapters available to enable the pen to accept International sized cartridges. Still, I'd rather use a Platinum cartridge and syringe refill it. Weight & Dimensions (09/10) - It's a mini pen, no pocket pen, no wait--standard size? Nothing extraordinary here. Length is 12.3cm capped, 10.8cm uncapped, and 15.2cm posted. Thickest point is 1.1cm. Weight is negligible... lightest pen I own! Quite a contrast to the smaller in length Pilot M90. I am partial to the pocket pen design, making for a small capped pen and larger posted pen, so I can't help but give it praise in this department. Nib & Performance (08/10) - Double your pleasure, double your fun! So, here we have two nibs for you: XF and F, combined in one nib. You can barely make out the difference in my writing sample, but that's because of the paper. When I used a quality paper (not the printer paper seen below), I could see a finer XF line--there was definitely more distinction. On either side, the pen writes pretty well. The most impressive thing is that you can write very quickly and the flow keeps up--no skipping. And the nib is slightly soft. It has enough tooth for control, but doesn't feel scratchy. The "F" side writes a bit wet, and pools a little extra at the end of lines. But the "XF" side writes very cleanly. You can write on angles from 35 to 75 degrees without much trouble. The sweet spot is narrow, though. And because of the nib design, without an obvious nib slit visible, it becomes difficult to know your orientation in subdued light. If you're off the sweet spot, you don't get even flow. 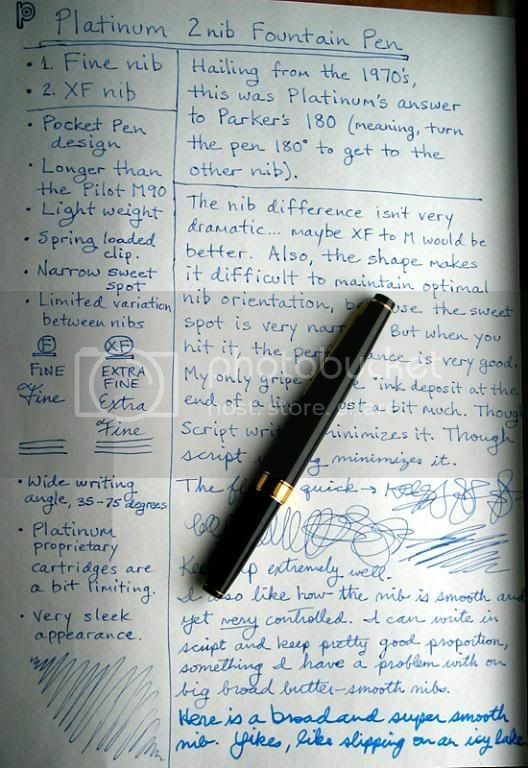 Once you get to know this about the pen, it is easy to compensate. Otherwise, I'd have given it a 9. Filling System (06/10) - Bah, humbug. Proprietary ain't fun. Platinum just had to do things their own way... but so did Pilot and Sailor. Unfortunately, they don't make converters for their small pens, so you're stuck with just cartridges (unless you get an International adapter). Although Platinum made an adapter for International cartridges, they must be purchased from retailers who usually demand that you buy a pen with it. If Platinum would make it as a separate item you could purchase, I'd have given them more credit. These pens are usually had via Japanese sellers on "that auction site." Prices vary tremendously, depending on the seller, the pen condition, and the bidding pool at the time. I've seen them as low as mid $30's and as high as about $90. 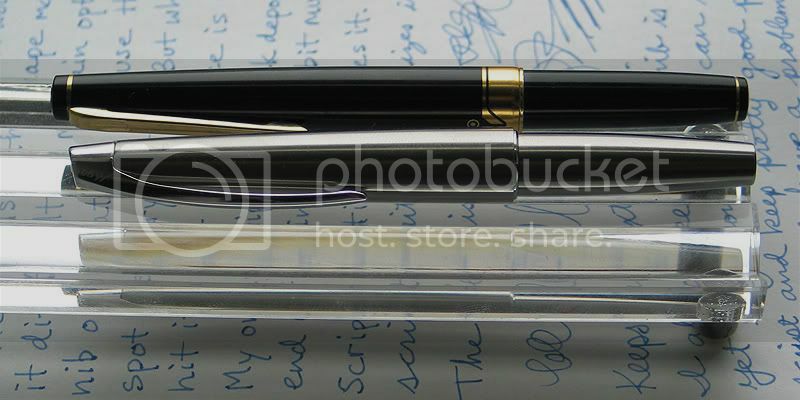 Most Pilot Elite pocket pens in good condition tend to sell in the upper $30's to mid $40's. The fact that this pen has a "double nib" design makes it unique. So, I'd say scoring a good condition one in the mid to upper $40's is a very decent deal. Conclusion (Final score: 7.8) - Not a bad deal. This is a good choice for a pocket sized pen. However, be prepared to syringe refill it if you want ink diversity. You can refill cartridges and then plug them, for travel, so it is conceivable that you can take this pen with you on a trip. The neatest factor is the nib design... it looks strange, unusual, and intriguing at the same time. I think it has a more appealing look to it than the Parker 180. I'm glad I decided to get one... it'll be with me for a while, I think. Edited by MYU, 22 June 2009 - 19:07.
very nice! i didn't know about the 180 nib on these pens. thanx for the great review... love that long cap!!! Platinum used to make a squeeze converter, but it's rare to find one now. If you cut a half inch off the turning knob of their standard screw converter, though, it works in their pocket pens (albeit the capacity is not enormous). Thanks -- I try to get in a review about an unusual kind of pen now and then. About the current Platinum converter, the mechanism is a bit fragile. I've got one that only catches the piston rod if I push inwards on it--otherwise it just spins. So, when trimming the nob, the vibration might cause this kind of problem to occur. But in any case, I agree that the decreased capacity of the converter is a bit unsatisfying (appears slightly less than a CON-20!). Better to refill a cartridge. EDIT: Disregard my previous Platinum converter comments... Interestingly enough, this converter can be disassembled. Apparently the piston head wasn't firmly planted on the rod... I fixed that and reassembled the converter--works perfectly now. Still, a cartridge is probably the way to go if you need better ink capacity. Edited by MYU, 24 June 2009 - 02:25. Interesting, thanks for the review! The idea appeals to me. I'd love to see new sample pics with a more showing paper.